Welcome to the first day of May and my very first Wine of the Week post for the month and another dreary cloudy day here in San Diego, uggh, hello May-Gray. With the month of May, just getting started many folks are starting to think about the upcoming swim-suit season, where some will bare more than others and rightfully so, while still others will just let it all hang-out, regardless of how it may appear. Now a new "app" has come along, which some rush to call, “controversial” [new media buzz word] which measures how-hot or not a person may be. C'mon really, this is just a new twist, on the age old question, "mirror, mirror on the wall who's the fairest of them all?". Nothing really new to see here, just a re-tread of the same old tire and the beat goes on. But on the flip side of that coin, most folks think they look better than the average joe. The funny thing is that; according to a survey conducted by UCLA and California State University researchers found that most of us think we're better-looking than average. In fact most folks think they fall somewhere, between a 6 and a 7 on a 10-point scale better looking the average vino-sapien. The online survey sampled a group of about 26,000 msnbc.msn.com and ELLE.com readers, ranging in age from 18 to 75. Contrary to the popularly pushed narrative, self-esteem would seem to be at an all time high, but whose keeping score anyway. You can see this same issue or constant theme in the world of wine, collectively we put out our measuring sticks, [no, not the one the President carries] add and or subtract points based on list of criteria to determine which wine or wines are the fairest in the land. Some wines also think they are more attractive than they really are, but that is not the case today, as I've uncovered another wine, which I think is among the fairest in the land, swimming in sea of Chardonnay sameness. That said, this Chardonnay, a true Cuvée, sent to me as a sample for the review process, is far better than average. As you may know, I'm never too ecstatic about Chardonnay or other white wines in general. But, every once in a while, I have a reason to pop the cork on a good one, especially when I know it will [potentially] pair amazingly well with what I have on deck for the evening meal. 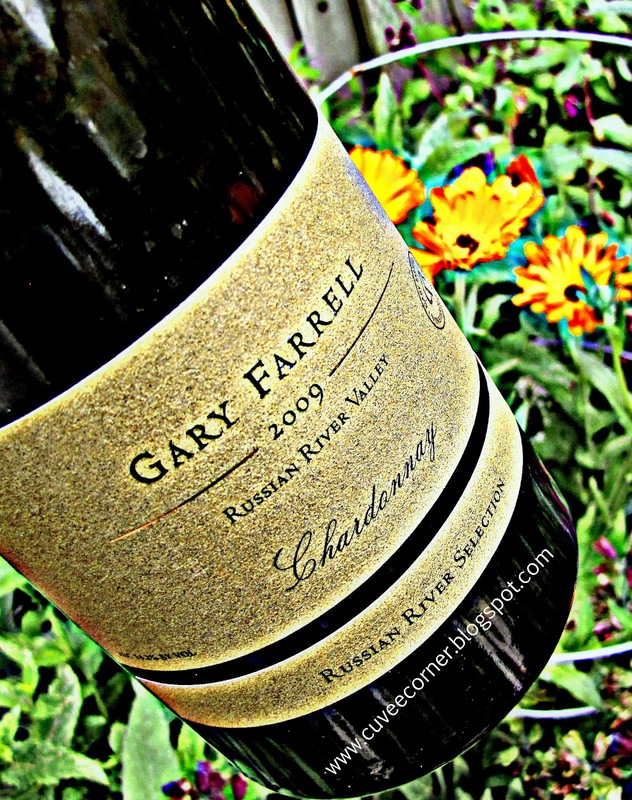 Last night was the perfect occasion to pop the cork on the Gary Farrell, Russian River Valley 2009 Chardonnay, in a word, wowsers. Mrs. Cuvee, who hardly praises anything with more than her typical; "uh, it's okay", gave this wine a "good" to great rating. As for me, wow soon as I got a splash of this bad boy in my glass I knew, I was in for a real treat. Vivid aromas escaped easily from the glass, fall apples and ripe pairs mingle nicely with caramelized oak, and you could smell the freshly buttered toast and vanilla richness, giving an open invitation to dive in. A barrel aged Chardonnay, which I’m guessing is 2nd use French Oak for twelve months or longer. The fruit was sourced from some top [undisclosed] vineyard locations within the Russian River Valley, most likely grown on Wente Clone root-stock. Quick tasting notes, this wine is super rich, very creamy from the first splash to the last drop. Don’t chill this bottle too much or you’ll miss all its subtle nuances. This wine is no slouch in the flavor department either; delivers baking spices, wet-stone, clove, hazelnut and a bite of crisp ripe apples, painted over a fresh canvas of acidity, making for a mouthwatering delight. Part of the reason I believe this wine is so stunning, can be found in the winemakers note; speaking directly about the 2009 vintage, “Chardonnay and Pinot have shown excessively small berries resulting in wonderful, concentrated flavors.” I scored this wine 92 points and it sells for a SRP of $32. Personally, I'd lay down a few bottles; layers of complexity will reward the patient, with another year in bottle. I paired this wine with one of my favorite meals, a recipe taught to me by my lovely Hawaiian born, Mrs. Cuvee. It is simply called Chicken Katsu-Curry, served over freshly steamed brown rice, with a side of lightly salted edamame pods. If you are not from the islands, you may scoff at this recipe and its supposed pairing with the style of Chardonnay from Gary Farrell, but once you try it, there is no going back. If you're interested in my preparation technique, leave a comment below and I'll return the favor with my recipe. Well folk that’s all I have for you today, continue to sip long and prosper cheers!